Initiatives like the EU code of conduct for Data Centre Energy Efficiency and the UK Government Carbon Reduction Legislation are all steps in the right direction for reducing energy demand. But many of the recommendations are more appropriate for a “Green Field” approach rather than the “Brown Field” reality of today’s data centres. 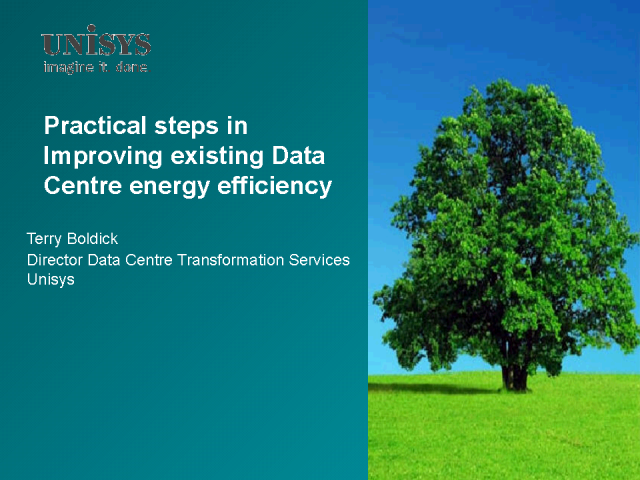 This session from Unisys will cover practical actions than can be done today to improve energy efficiency while minimizing the potential distribution and risk to the business. Terry Boldick has extensive experience in the design, development, implementation and support of IT transformation projects. Currently he is working with IT managers on carbon reduction strategies and the impact of the UK Government recent legislation on Carbon Reduction. Prior to this role he has been managing large and complex virtualization projects involving not only technology but the alignment of business and IT expectations.